New Balance Fresh Foam Vongo v2 are stability cushioned running shoes. 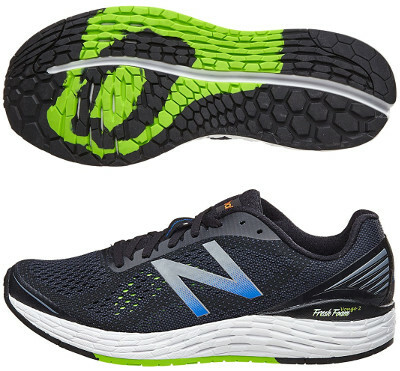 The New Balance Fresh Foam Vongo v2 keeps the original idea from the american brand of natural running shoe (just 4 mm drop) with pronation support among Fresh Foam collection and more modern running shoe concept compared to more conventional 860 v7 or premium 1260 v6 but from top to button redesigned. Although bootie construction remains from its predecessor Fresh Foam Vongo, upper has been completely updated with breathable engineered mesh (following trend from Nike's Flyknit or Adidas' Primeknit) combined with FantomFit overlays which provide some not so powerful structure. External but simple heel counter not only features more stability but also increases visibility under poor light conditions. Not a maximalist shoe but the impressive Fresh Foam midsole from Vongo v2 also provides progressive pronation support without intrusive double density but changing Fresh Foam structure in strategic zones. New Balance is moving from typical hexagonal shapes into a more diverse configuration with lateral slots to increase flexibility. Longitudinal groove splits outsole in two areas with hexagonal lugs in internal one and rows of pentagonal ones in the external to promote smoother ride.